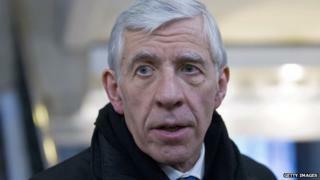 A review of the Freedom of Information Act will be "open-minded", former Home Secretary Jack Straw has said. The Campaign for Freedom of Information, however, says the panel does not include any advocates for transparency. It suggests changes will see more requests being refused, resulting in "bad decisions and policy mistakes" concealed. Speaking on BBC Radio 4's Today programme, the director of the Campaign for the Freedom of Information, Maurice Frankel, said the panel's composition "was not the basis for an independent review". Mr Frankel added: "Jack Straw has already made his views [clear] on all the issues - he's in favour of restricting the act to make it impossible to obtain policy advice or internal discussions, he's in favour of introducing charges for information and making it harder for people to obtain information." Mr Straw said some critics of the commission would complain even it were "chaired by the Archangel Gabriel". "I think that it's right to review the operation of the act," he said. "Of course, the Freedom of Information Campaign would criticise any review.... but I go into this inquiry to be as open-minded as possible and to weigh the evidence carefully including that from the Freedom of Information Campaign." A Labour source said Mr Straw was acting in a personal capacity on the commission and was not representing the party. The source said: "If the government were genuinely interested in improving the workings of the act, it should have chosen a more balanced panel." A Labour Party spokesman said: "The commission's terms of reference clearly invite a change in the terms of the act. Our freedom of information laws are a crucial check on the power of the executive and the government should not attempt to restrict them by the back door." The passing of the act gave anyone the right to access recorded information held by government and other public sector bodies. It obliged public authorities in England, Wales and Northern Ireland, and UK-wide authorities based in Scotland, to publish certain information about their activities. But former Prime Minister Tony Blair has since described the law as one of his "biggest regrets", arguing it has had the effect of denying civil servants a "safe space" to properly advise ministers.